Bandai/TCI's 1/700th Scale Injection Molded Kit was released in the US by Twentieth Century Imports circa 1985. It's hard to find now, though still available at conventions, some hobby shops, and dealers of collectibles and OOP kits like John F. Green. Score (1-10): 8 Ease: (1-5) 2 - Not Hard Verdict: Worth the money, if you can find one. from just above the bow. By today's standards, this kit may be a little wanting, but it was a state-of-the-art product when it hit the market in the late 70s/early/80's. The kit is composed of 57 flash-free parts, molded in two colors. This includes a small medical rescue craft (called a "lifeboat", in the instructions). It's unclear whether this lifeboat is to scale (1/700), but it looks like it may be a little large - say around 1/200. All panel lines are heavily engraved. This is one of the features where the kit shows its age. The depth of the engraving is reminiscent of the 1970's Matchbox offerings - a little too much. 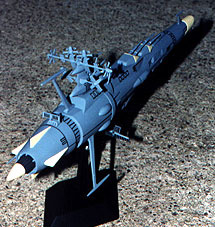 The panel lines improve dramatically with later kits in the series, such as the 1/700th EDF Battle Cruiser. There are also some slight problems with the lines "fading" as the get closer to edge of the rounded hull halves. But these drawbacks are easily addressed. The Patrol Cruiser requires no decals, but there are "stickers" provided for the lifeboat's markings. Needless to say, waterslide decals would have been preferred. This features plays to the "toy" qualities of the kit. A view from the aft. This was a pretty stock build. That's why I chose this project. I wanted something quick that would build up to a decent kit, right out of the box. The parts fit was straight-forward and fairly clean. Only a few small areas needed putty. For the most part, the kit just fell together. Japan's state-of-the-art in 1980 was nothing to scoff at! The only significant modification I made to the kit was to drill out the gun barrels of the main batteries with a pin vise. Since its scale was in question, I decided to build my kit without the lifeboat. I figure I'll build it later and display it separately. That meant I needed to fill in the hole for the lifeboat display arm on the display base. The Patrol Cruiser mounts on this base with a ball joint, tightened by a srew and nut. This allows you to change the position of the Patrol Cruiser at any time. Again, it's a little toy-like, but it still finishes into a fine kit. A close-up of the superstructure. 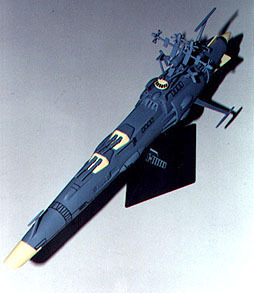 The box and instructions show the paint scheme seen in Yamato 2/Arivaderchi Yamato. Instead of going with that scheme, I decided to go with the less seen scheme shown on this class of ship in Yamato 3 (the third TV series). While being uncommon for this class of ship, it's in keeping with the paint schemes seen on most other EDF craft of this time period. One nice piece of engineering concerns parts and how they're broken down. If you do choose to paint the two-tone blue scheme, the parts are structured in such a way as to make your painting as easy as possible. If something is a different color, it's usually a different part. This engineering philosophy was used on the rest of the line and refined as time went by. I finished the whole ship in Polly S colors. All the colors were custom mixed to match photos I had from the show. Once the paint had dried, I used an 01 Micron Pigma disposable technical pen to ink the panel lines. I think this was my greatest blunder on the kit. Because of the breadth and depth of the engraving, the inked panel lines ended up very bold. While it does instill that anime, painted-cel look, it does so a little much for tastes. If I had to do it again, I'd use a soft lead pencil to do these. That would give me greater control and result in less contrast. "Space Battleship Yamato" is © Leiji Matsumoto and Voyager Entertainment. "Starblazers" is a registered trademark with Westchester Films, Inc.
Last updated 27 November 2000. This page Copyright © Starship Modeler.